When I first read the plot for Ink I was excited. A story where things on paper moved intrigued me. Even reminds me of the manga Death Note. In the beginning I was all for protagonist Katie Greene. She’d lost her mother a five months ago and then was sent half a world away from America to live with her aunt Diane in Japan because her grandfather was struggling with cancer and it was thought that she’d thrive better in a new country, a fresh start of sorts with her mother’s sister. Yet the more I read, the more this story seemed to belonged to Yuu Tomohiro and Katie was just a supporting character. Like any normal sixteen year old, Katie attends a Japanese school and wears the short tartan skirt, white blouse uniform but with her blond hair she sticks out like a sore thumb—a gaijin, a foreigner. At first she struggles with the language and makes only two friends, Yuki and Tanaka. But on the ill fated day when she returns to class to retrieve her shoes, she overhears a heated break-up argument between school hottie Yuu Tomohiro and his girlfriend Myu and what’s worse, she witnesses the girl in one of his drawings moving. Alas, this is where the book begins to go down hill. Katie becomes a bit of a stalker trying desperately to find out more about Tomohiro and his moving art. She’s seriously conflicted about her feelings for him but she insists on sticking her nose into his business with no good reason. Katie is fast becoming my least favorite person in this book. There’s just no good, rational reason why she should delve into Tomohiro’s background especially as it doesn’t affect her in any way. She’s constantly assuming things instead of asking and when she does ask, it’s usually with an attitude. Nevertheless, I continued reading this story because it’s set in Japan and I love stories set in Japan. Of course, by chapter 5 I’d expect to have found out more about or even ‘see’ the drawings move with an indication as to why this is happening but the story continues to center around Katie’s distrust-like-desperation to delve into Tomohiro’s past without a proper reason. Then low and behold in chapter 7 I finally find out, along with Katie, that Tomohiro is a Kami, a paper god, with the power over ink and drawings. And that the ink reacts in weird ways and has a penchant to do evil, especially when Katie is around. But then Katie laments that “it was too much for me. My head filled with a fog of confusion. It ached to wade through this new, unwanted knowledge,” and I wonder why then did she fight so hard to find out his secret in the first place if she didn’t really want to know? And even more annoying to the reader is the fact that Tomohiro knows he’s a Kami and that he “can do something with his mind” yet he “doesn’t understand it.” What? I thought Tomohiro was smart. At least that’s what I was led to believe. He’s been drawing for a very, very long time and you mean to tell me in all that time he hasn’t figured out some of what he can really do with his mind? I’m not buying this. It sounds forced just like the relationship between Tomohiro and Katie. 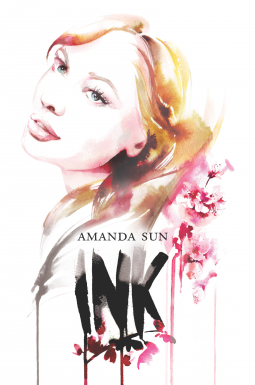 The initial idea of this book – the power of ink causing drawings to come alive, set in beautiful Japan, with characters that mesh well together – is one that I was more than excited to read, the concept, though not new, intrigued me, but this isn’t that book. Katie left me exasperated and annoyed. Why is she stalking Tomohiro? She is either pining after him, jumping to conclusions, easily lead astray, angry, or desperate to be with Tomohiro. Her character is flat, lifeless and serves no purpose but to bring Tomohiro’s character to the forefront where he really belongs. At this point she should just be sent back to America. Even though I was disappointed in the main character, I still thought the story was different enough to be worth my time. It seemed every other character pulled their own weight in moving the story along and that’s a big plus. Sun’s effortless description pulled me into the world she’d created and opened up my imagination. The way she described the cherry blossom blooming, it was as if I was there watch the beauty of it all unfold right before my eyes and when the blossoms died away, I felt the stark emptiness at the loss of their beauty. Yes, I’ll stick around for the sequel because I’m intrigued, I want to know more about Tomohiro and the Kami and their awesome power over ink and drawings. This entry was posted in Books, new release and tagged FANTASY, Japan, paranormal, ya. Bookmark the permalink.